All the HOD's are requested to conduct monthly tests of MBBS students as a part of contineous day to day assessment and display monthly attendance and performance report in the department Notice Board. 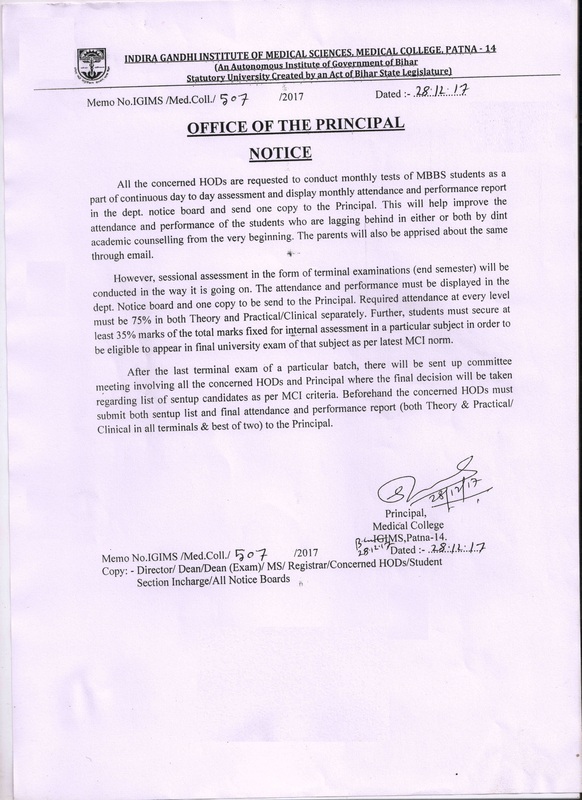 To submit advance monthly teaching schedule as per MCI prescribed format for uploading in Institute Website. Examination Notice: 5th Semester Examination of 2015 Batch MBBS Students. Notice: To attend Yuva Clinic of UHTC, Shastri nagar, Patna under the Rastrioya Kishore Swasthya Karyakram. 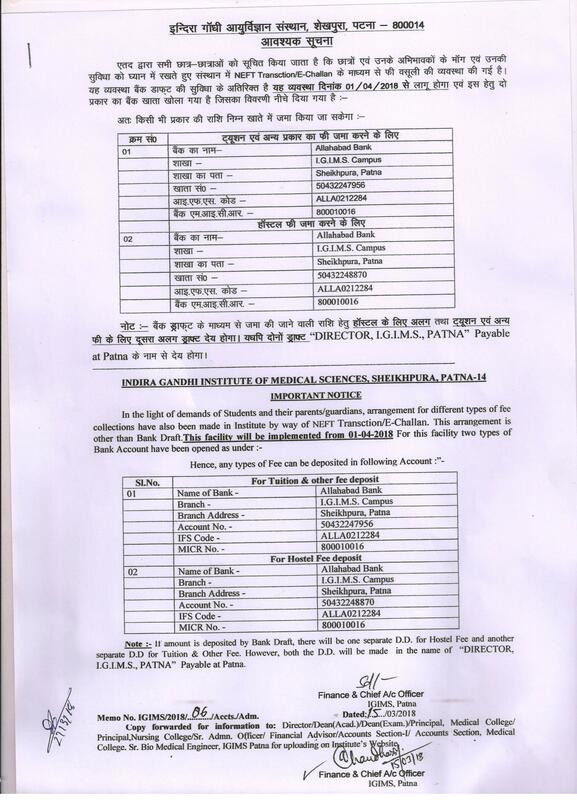 Notice: Revised Room Allotment Order (Phase - I) in New MBBS Boy's Hostel. 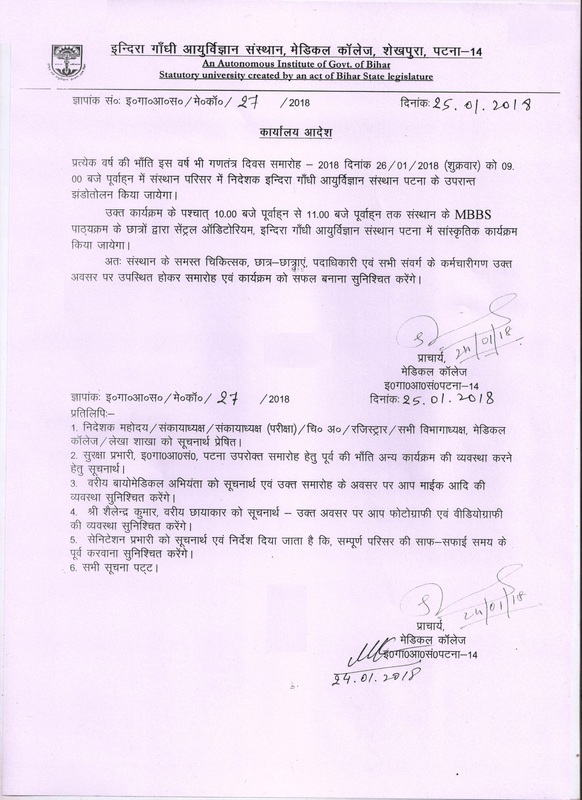 Notice: Room Allotment Order (Phase - II) in New MBBS Boy's Hostel. b. 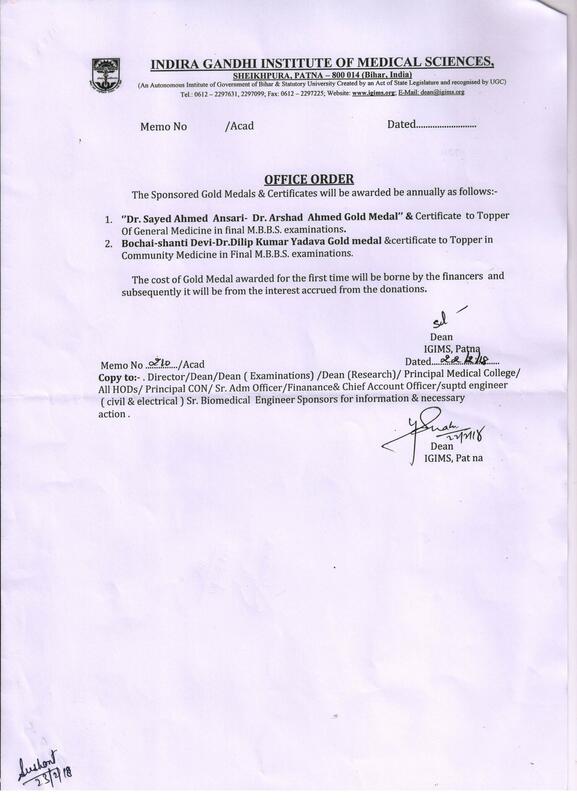 "Bochai-Shanti Devi - Dr. Dilip Kumar Yadav Gold Medal"
Notice: Room Allotment Order (Phase - III) in MBBS Boy's Hostel. Office Order: To vacate the lecture theatres immediately after the classes are over. Reg. : Transfer of scholership and education loan of students in new Account No. : 50432247956. 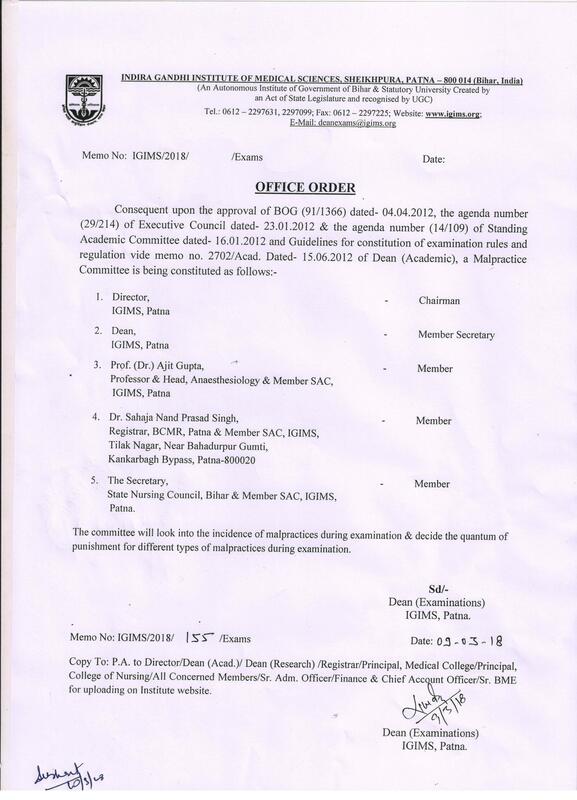 Notice: Reconstitution of Hostel Committee. Minutes of the 21st meeting of College Council held on 14.06.2018. Notice: Regular academic counselling and mentoring of MBS Students of various batches. Notice: Following candidates of 1st Professional MBBS Examination 2018 ( I ) held in the month of August / September - 2018 are decalred pass. Notice: Last date for submission of Thesis / Dissertation by Post Graduate Students (Broad Specialty) of Session 2016 - 19 is 30th November 2018.
dt. 08.11.2018. Notice: Non-sent up and unsuccessful MBBS Students (2017 Batch) must attend extra theory and practicle classes to make up the deficiency in attendance. 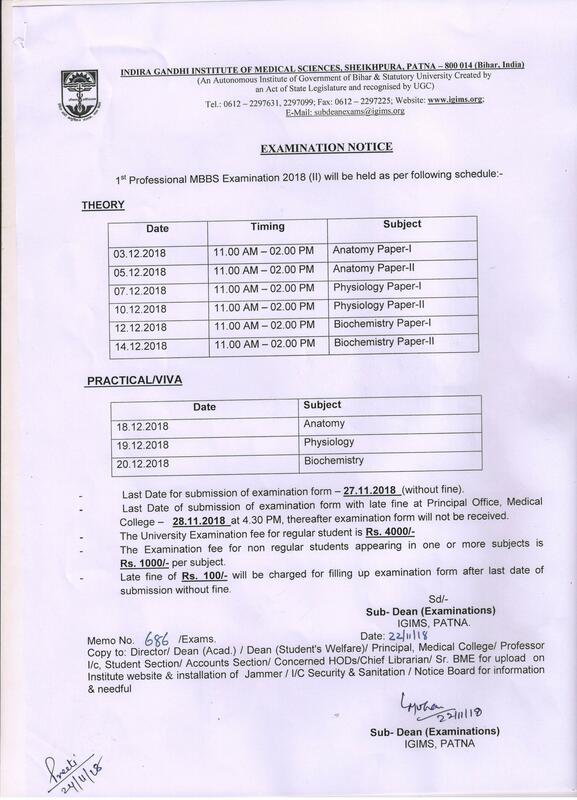 Examination Notice: 3rd Professional MBBS Part - II Examination 2019 (i) schedule. dt. 26.09.2018. Office Order: Prof. (Dr.) Sanjay Kumar, HOD, Community Medicine will work as Professor In-Charge - Students' Section. dt. 31.12.2018. 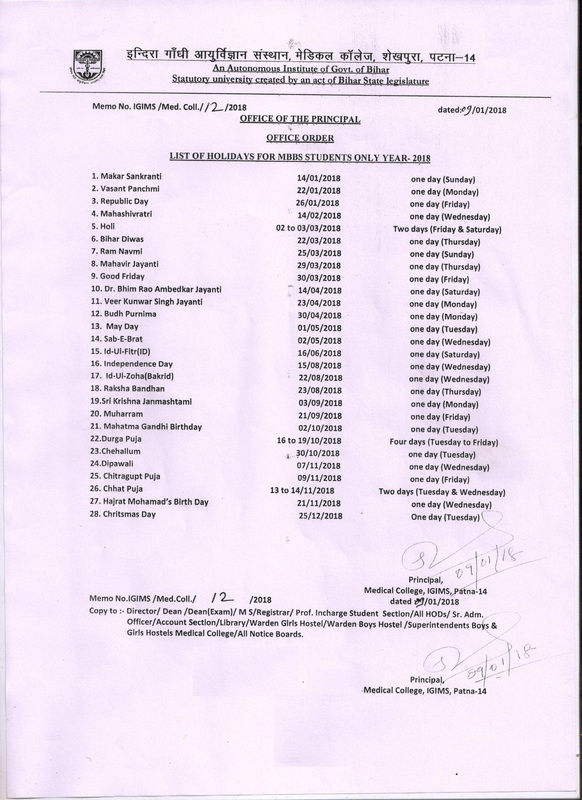 Notice: List of holidays applicable for MBBS Students in the year 2019.
dt. 03.01.2019. Office Order: Constitution of the committee to look after issues related to students' scholarship. 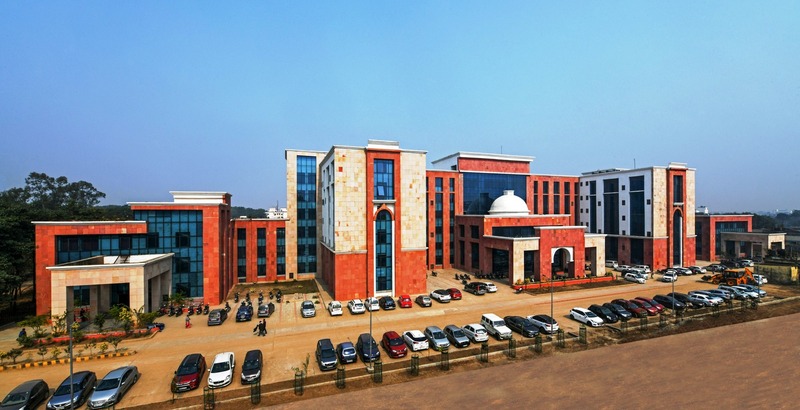 Examination Notice: Schedule for 3rd Professional MBBS Part - I Examination 2019 (I). 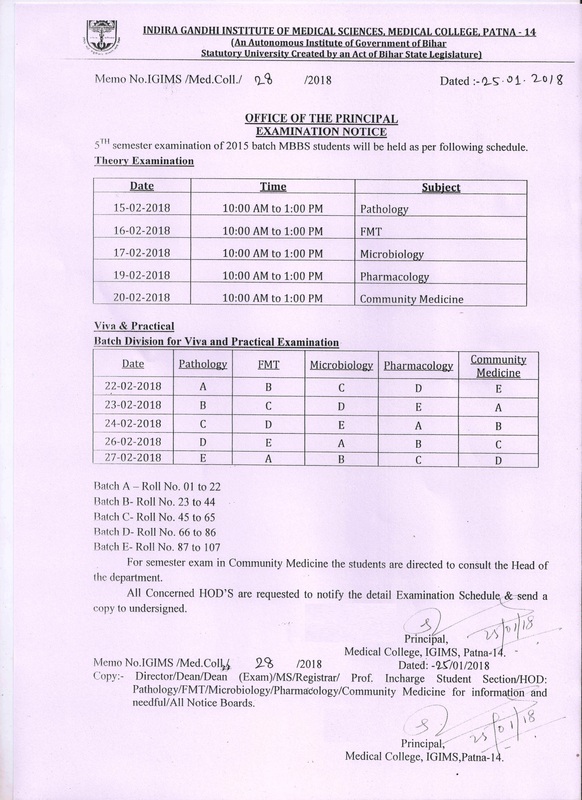 Examination Notice: Schedule for M.D. Examination 2019 (I). 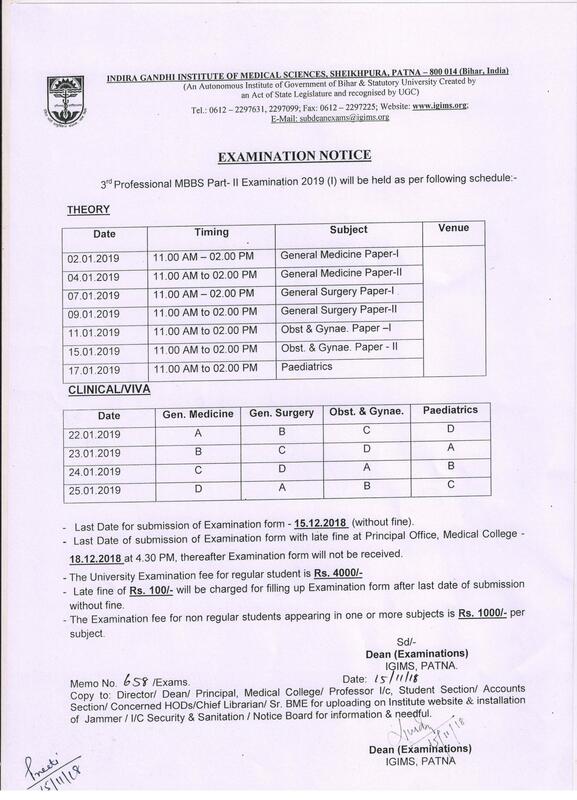 Examination Notice: Schedule for 2nd Professional MBBS Examination 2019 (I).